Ask fellow campers about "Illinois Beach State Park" and nearby attractions. Nice park. A balance between out of the way and close to town. My favorite part was listening to the waves on lake Michigan. The 300 row is closest to the lake and our A class let us see over the dunes to the lake. It was very full of Mosquitoes. We stayed in our rig as they came at us in swarms. Literally like the old "OFF" commercials they used to play. I was told by another camper that this was unusual, but it was our experience. Sites are only electric. Water and dump station at back of park. 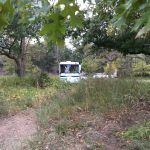 We camped at Illinois Beach State Park in a Motorhome. Close to Zion and Waukegan ILL. Good camp store. Although the 300 was closest to the shore, most of the sites in all rows were beautiful. Not impressed with stay here. Positives, level gravel site that is shaded with lots of space between sites. Negatives, bathrooms unkept with dead insects on walls and screens. 2 showers in women's bathroom. One appears to be handicapped or family. Someone was washing their dog in that one. Noted no signs prohibiting pets in bathrooms. The other shower is very small. Showers are push button with no options to regulate temperature. Beach area is not very big and is rocky. At 8pm there were announcements over loudspeaker for beach area to be vacated. Parking area unkept and looks like grass hasn't been cut all season. Abandoned concession stands kind of spooky. Paved walking trails. Would not go back. We camped at Illinois Beach State Park in a Motorhome. Very beautiful spot. Spacious sites. Water access. Good walking and biking trail along Lake Michigan. Good mix of tents and rv sites. 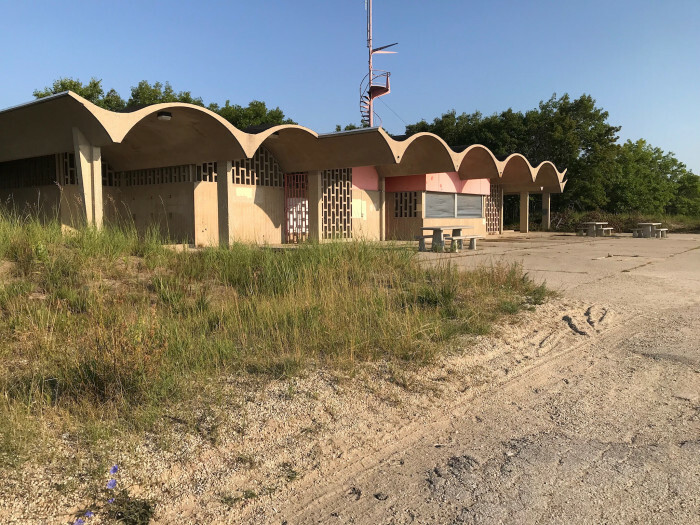 We were a bit disappointed by the dilapidated abandoned-looking state of the water access trail and ancient abandoned concession stands on the lake with gang griffiti painted over, but other than that, this was a great place. We would come again. Bathrooms old but clean and functioning. Campground has lots of trees -- good place to hang a hammock. No water hookup or sewer hookup, but both available on campground. We camped at Illinois Beach State Park in a Motorhome. Stayed 12 nights while attending numerous Chicago Art Fairs (expect terrible traffic and delays if going to downtown Chicago). Park is HUGE and well kept; has 2 large loops and a small "boutique" loop off to the right near the beach parking lot that has tons of shade and only a few spots. Beach was great. Our dogs loved the beach walk North. We had nice weather and variable temps, a few hot days and some cool. Our site was 303, mostly sunny but not hot, near the beach access and picnic area, only 100 feet to water/trash/small camp store (weekend only). Staff was good, only really had any close neighbors on the weekends and they were fine as well. All in all, a great base of ops for our Chicago trips. We camped at Illinois Beach State Park in a Travel Trailer. Lewis Fresh Market, awesome fresh fruit and pretty much everything else. I have mixed feelings about this park. It is very nice with trees, walking path etc. and easy beach access. On the other hand, there is little maintenance. The bathrooms need updating. No soap is provided in the bathrooms. The shower is a push button you get water at whatever temp until it times out. 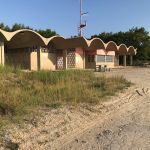 There are beach concession buildings and showers that according to a local have been abandoned and boarded up for decades. They did frequently empty the trash cans. Staff was friendly. There is no charge to enter the main park which is adjacent to the camping area. There is a HUGE public parking area for the beach which is next to the campground. We saw some undesirables in that lot the first few days which we reported to staff. After that we saw more police presence and no more questionable activity. You can't stay longer than two weeks so no permanent folks. No sewer so most are there for a couple of days by my observation. We were there two weeks so dumped once and conserved after that and dumped on our way out. We were there for Memorial Day weekend and while it was full it was not crazy and neither was the beach area. A host told us they just became a no alcohol park (there are signs up). We did not witness any alcohol incidents although no one is naive enough to think there was NO alcohol in the park. Roads are easy to navigate in our big rig. Most sites are level but some have a slope so if you are in a large RV scout them out first. Some have more shading than others and that affects satellite reception. Staff patrols frequently. Sites are very wide and deep. Plenty of overflow parking. Our power was a 30 amp plug, but a sticker on the box said not to exceed 24 amps. We blew the breaker several times even though we were not using the A/C or high amp things all at once. The 50A sites are either handicapped paved sites or the 50A area which is side by side in an open paved lot with limited shade. It is like being in a Walmart parking lot with a power pedestal. We camped at Illinois Beach State Park in a Motorhome. Go to Louie's in Waukegan. It is a 70+ year old bar/restaurant that is like stepping back in time. I though Al Capone was going to walk in. The food is FANTASTIC. Portions generous and reasonable prices. Owner is very friendly. The bread is out of this world. There is a $5 fee if you use reserveamerica.com - well worth if planning to visit during the busy summer months especially on a weekend. Verizon cell and Sprint Myfi worked well. This is a lovely, large campground inside of a huge state park along side Lake Michigan. There is lots of green grass and big trees with walking/biking trails for miles plus there is the nearby beach/lake. The sites are nicely cleared and level. While the park does not offer water/sewer at the sites, there are many locations to obtain fresh water and there are bath houses and toilets throughout the campground. There are ADA accessible sites, a place to purchase firewood & ice and a large dump station (two lanes) with ability to obtain fresh water. We found the staff to be VERY friendly - not only at check-in but also when we added on days (since we loved it so much) and again when we inquired about how to take the train to Chicago. The Permit Booth has train and L/Bus schedules to help you plan your trip. Because we wanted 50 amp, we were in the paved section but you still have a "camp feel" with a large sites, grassy area, picnic table and fire pit. We were able to obtain a DirecTV signal but some sites might not allow it due to trees. The nearby Camp Host was available and helpful. There are conveniences close by including an OscoJewel and Walmart. We highly recommend this park. We camped at Illinois Beach State Park in a Motorhome. Depending on your plan, investigate I-Pass for tollroads. It works in numerous states. You can buy one at Jewel Osco. If you have more than two axels, you'll also need a Blue I-Pass for your coach which can be obtained at I-Pass offices (we went to the one at Lake Forest Oases). It's easy to take the train to Chicago but takes time. As daunting as public transit may seem, it is MUCH better than driving into the city. This park is right on Lake Michigan it has an area with pine trees that is wonderful. Nice breeze lots of shade. They seem to be tearing something down close by as there is quite a lot of daytime noise but it didn't really bother us too much. There is a bike trail right adjacent to the park we are going for a bike ride in a little while. We camped at Illinois Beach State Park in a Motorhome. Convenient grocery store. The park is really right in town. It's a small town but still everything is nearby. We stay at this park occasionally when visiting Chicago. Sites are very generous. The beach is small and rocky and some buildings are in disrepair. We camped at Illinois Beach State Park in a Motorhome. We like to go to downtown Chicago and you can take the train from Waukegan station. It is a long drive especially with traffic. This park is one of our favorite places. Sites are shaded and large enough for our trailer. Love being on the lake. Normally we see several deer but this year we have only seen two. We camped at Illinois Beach State Park in a Travel Trailer. Events on the beach. Resort restaurant has good food. Trail to walk or ride bike. We loved this park. Short walk to the beach at Lake Michigan. Plenty of trails to ride our bikes, or walk. Easy access to local retailers for those things you forgot. We'll be back after we work through the west! We camped at Illinois Beach State Park in a Travel Trailer. There were no water or sewer hook-ups. The water from the entry way main spigot smelled really bad. Had trouble with electric outlet at 2 of the 3 sites we were renting. The beach right next to the campground was not suitable for swimming and the concession stand nearby was closed down. Lots of biting flies at the campground. We camped at Illinois Beach State Park in a Motorhome. Beach is nearby but best to drive to next to the lodge to swim as the swimming nearby the camp sites is not good. With no water or sewer you are forced to use the dirty, nasty showers and restrooms. Fill up your water tank before parking. The only positive is our big rig site on blacktop was level. Did not enjoy and won't stay again. 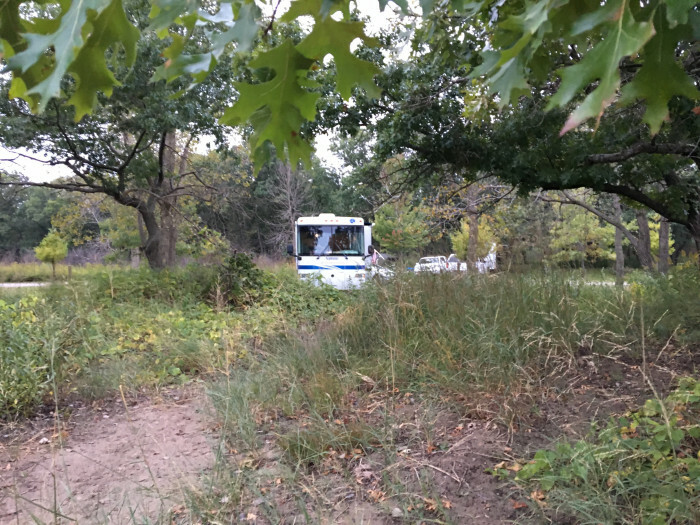 We camped at Illinois Beach State Park in a Fifth Wheel. The park was easy to get to from I-94. The staff at the contact station was very nice and helpful. Electric but no water or sewer at the sites. Dump station is on the way in. Roads are paved sites are not. Our site was pretty level. No vegetation between sites so all the neighboring sites are visible. Lots of trees for plenty of shade on our loop however, there was a tree on our site that kept us from deploying our awning. Shower building was outdated and could use some remodeling. Plenty of hot water but the men's showers were small requiring a person to get dressed with no privacy. Lots of hiking and biking trails with easy access to Lake Michigan shoreline. We used the park as our base camp for outings in Chicago. It's about an hours drive to downtown Chicago. For what we used the park for we would stay here again. 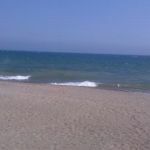 We camped at Illinois Beach State Park in a Travel Trailer. About an hours drive to Lake Shore Drive and the museums. We stayed here for Memorial Day weekend. It is a state park so we got what we thought we would, a campsite on Lake Michigan. Our site backed to the small dunes that lead out to the lake. Good size sites and fairly level. Nice trails from the back of the sites to the lake. Our site was across from the community water spigot, so between me and a friend in their trailer we had more than enough hose to keep our tanks filled for the weekend. We didn't use any of the bath houses so I can't say how good or bad they were. 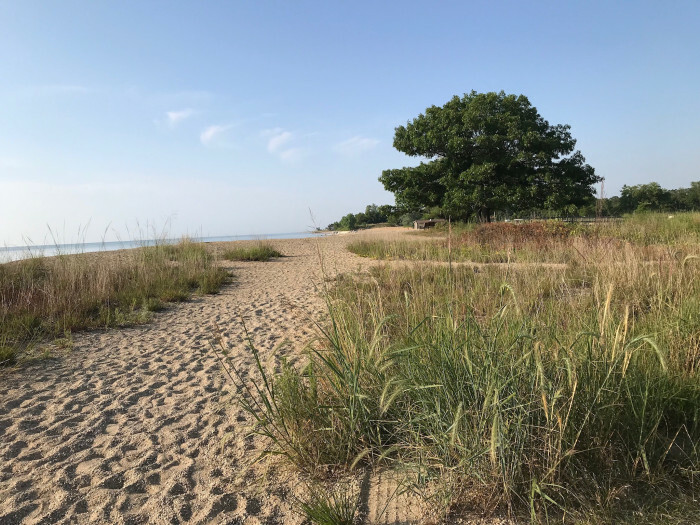 We camped at Illinois Beach State Park in a Travel Trailer. Bike trails from the park, so bring a bike. Also when looking at a site on the map, look for one near a water spigot. We were very surprised when we arrived to not have a water hook up. When making the reservation on line, it looked as though we would. We stayed anyway, but then found that the big rig sites that they offer are on an old parking lot they have converted to sites. The grounds were very grown up, lots of mosquitoes due to swampy water standing around every corner. Seemed neglected and left to the tenters. Restrooms and showers very outdated and not sure they had hot water. We camped at Illinois Beach State Park in a Motorhome. 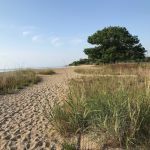 Are you affiliated with Illinois Beach State Park ?